Last edited by otterman; 03/11/14 01:08 PM. Boco is that last picture a dam break?? Yes Yukon,I use that set when the ice is coming on in Nov.No open water but not enough ice to walk on yet.I have set as many as 5 traps side by side in a set like that and take otter and beaver and the odd rat in one check.They are caught coming as well as going. Last edited by Boco; 03/11/14 02:29 PM. One thing to remember,these type of sets are only worth making when you trap an area that has extended trap check laws. In the lower 48 where you have to check traps every day these sets are hardly worth making. How often do you have to check in Ont.?? Here it's 7-days for kill sets....5 for restraining traps. None in the North for either kill or restraint. 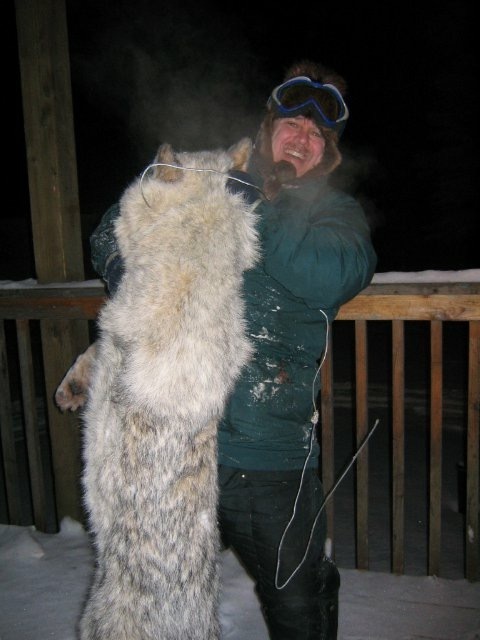 In the south I believe it is none for killing traps and daily for restraining traps. Personally I would not leave a live animal in a trap more than a day. It is kind of silly to have a trap check time on killing sets. There is a statute that says it is an offense to let an animal spoil in a trap. Last edited by Boco; 03/11/14 04:34 PM. Boco do you have a pic of the stabiliser with trap set and ready to put in? Would save some pole cutting for sure. Were do you get yours from? Boco do you have a photo of the conibear on a holder. How it is attached. I am wondering with using conibears such as bridged or duke, Because they are not as lethal as the Canadian accepted conibear, one would have more problems with them fighting the trap more before they drown and disrupting the other conbibear. Not sure they would work as close as yours. I tried these similar methods you shared with me last year and had multiple doubles. I did however keep them more spread out. I had better luck with a second set beyond the first. I had to make sure to keep my distance or put a pole divider between the side by side ones. I will take a pic of the trapstand and traps and the location of the blocking sticks. 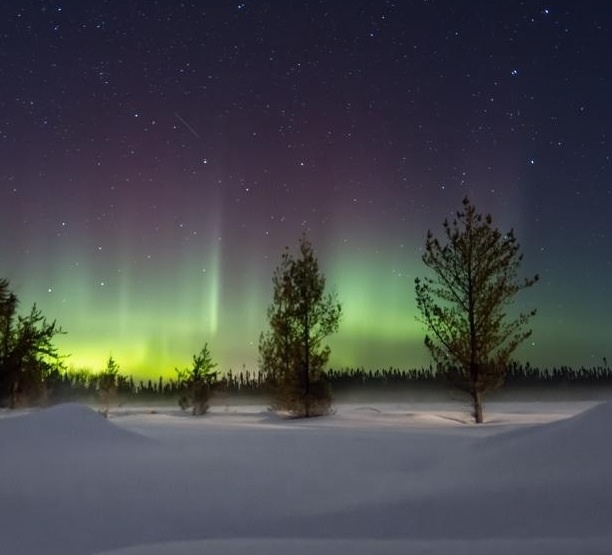 I will be away for a week so I will post pic when I return home. 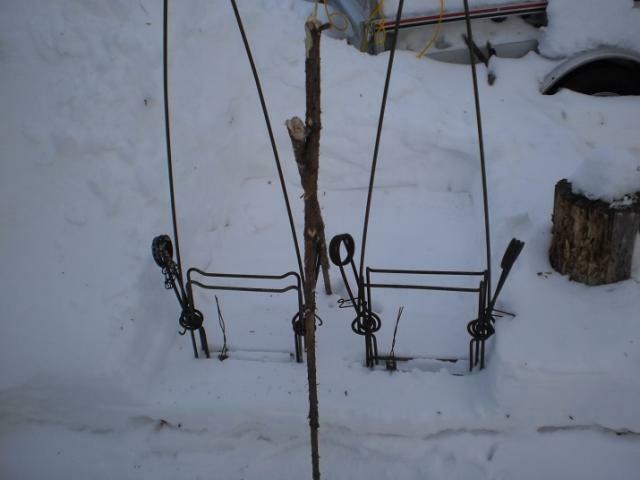 You can get away with weak traps under ice as the stands are stuck in the bottom and frozen at the top so the traps are solid.Same if you use tamarack poles. SK trapper one of our council members with a welder made them up.They are the same as the commercial ones except they are a foot longer. FT,once we cut the ice we determine the width of the run by feeling the side banks,as you can see,some are wide enough for 3 traps side by side,some are wide at the house and narrow down - those take two side by side and one out front where the entrance narrows,if the run is wide all the way out we set two or three close to the house and two out in front.The size and shape of the entrance run determines the configuration of the traps. If you are targeting a small house(a pair) obviously you don't need 4 or 5 traps,two will do. Last edited by Boco; 03/11/14 10:20 PM. I had not thought of that. 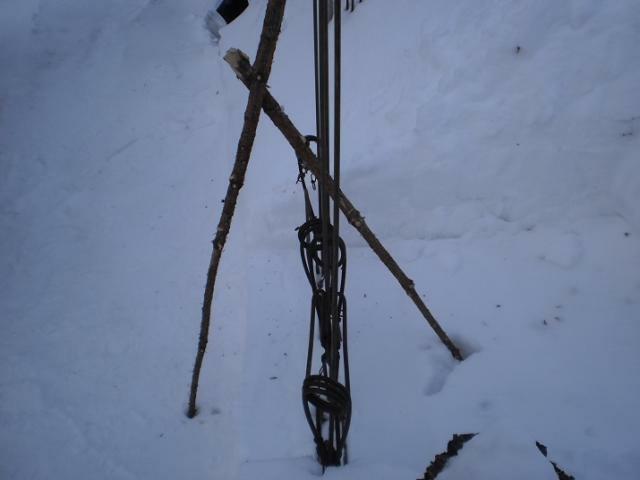 I use a single pole and when the trap fires the trap becomes loose on the pole and able to swing around. By securing both sides of the trap it would eliminate the problems I had with my one pole, (which I love to use.) method. I have used similar methods since learning from Boco on this site a few seasons ago. 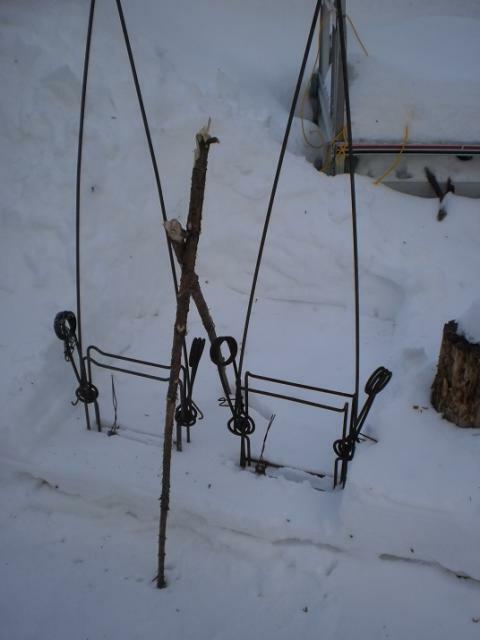 7 traps set to cover the runs, you can see 6 of them, I had to reach out with my chisel to place them and push them in the mud, then they were all wired to a froze in pole. If I could get a 50-60 dollar average, I could retire early and trap. I did get a 54 dollar average at the earlier FHA auction, but all large or bigger beaver. 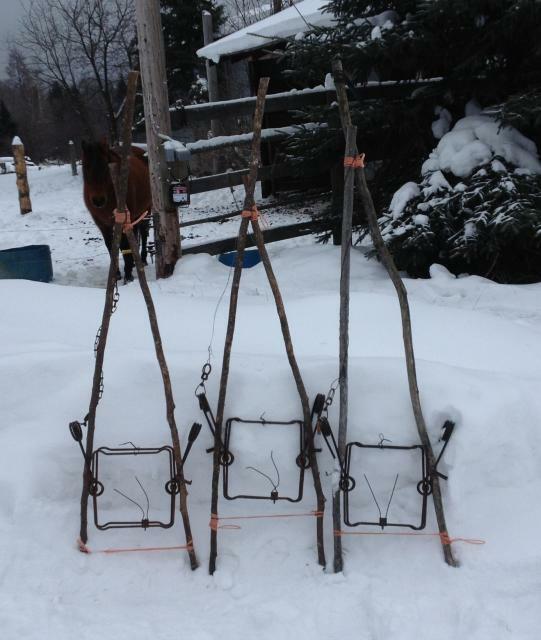 Well so much for early retirement, I just averaged 39 dollars on my nice winter beaver, mostly selects. Some didn't sell. 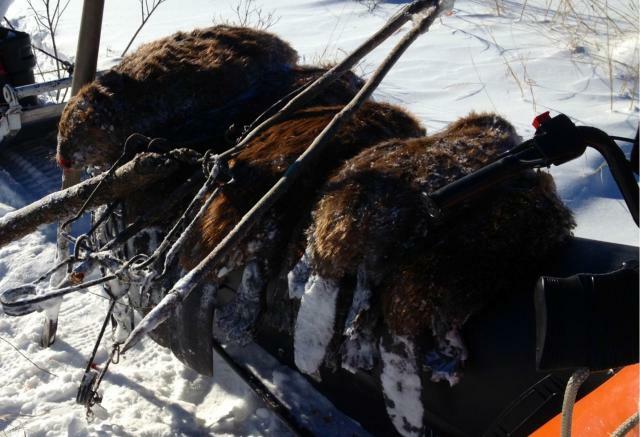 Averaged 54 on fall beaver and 39 on winter selects. Aaargh! Not putting any more beaver up! Hi Boco, did you happen to get a picture of your trap stands yet? Thanks for the reminder deerstand,I forgot about this thread. I showed this with two traps only,but in real life I would set one or two more out in front of those two. 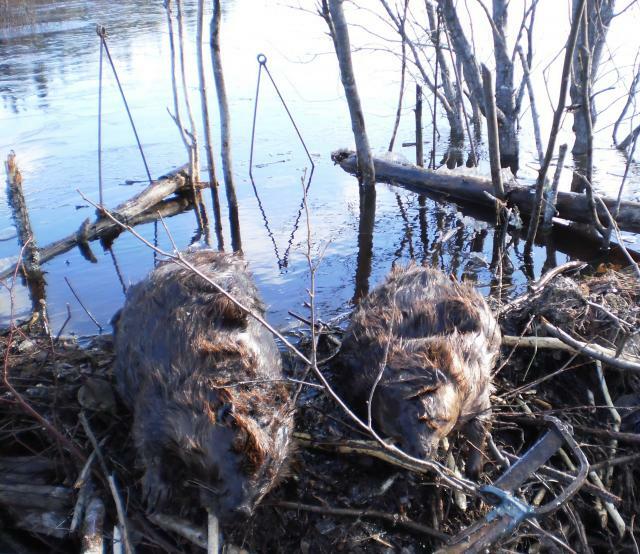 The block sticks should be positioned as shown to prevent one caught beaver from snapping two traps.When setting two more in front set far enough in front so caught beaver cannot fire trap in front or behind,leaving them working for the next beaver using the entrance run.You need block sticks when setting bodygrips close together,side by side.One trap is a belisle and one is an LDL. Last edited by Boco; 03/24/14 07:30 PM.